Helispecs can cater for all size lifting operations, whether it be light loads where we can use the Eurocopter AS 350 (Squirrel) which has a external load capacity of 750 kilograms through to larger loads or operations where we have access to the larger Bell UH 1H (Huey) where its lift capacity is 1500 kilograms (1.5 Tonnes). Helispecs is now being called on a regular basis to complete lifting jobs in and around the Perth Metropolitan area and in most cases it is less expensive, more efficient and the need to close roads for long periods as required when using conventional cranes is eliminated, so completing the task with a helicopter and one of Helispecs experienced and specialist sling load pilot is the most cost effective solution for your lifting requirements. Positioning equipment with helicopters requires experience and expertise. Helispecs pilots are out in the field doing this type of work and similar operations on a daily basis, so you can be confident you are getting the best pilots, crew and equipment to complete the task safely.All rigging is carried out by trained Helispecs staff and certified lifting equipment and all operations carried out have two way communications between helicopter and ground. Weights can vary on any given day due to weather or atmospheric conditions. Call us to discuss any lifting requirements as on occasions a helicopter is the most efficient and quickest way to achieve that lift without the need to build or close roads and our reach is far further than a ground based crane.Helispecs supplies experience ground crew/riggers and completes a Job Hazard Analysis(JHA) for all lifting operations. In August 2012 Helispecs was called in to lift off the old air conditioning ducting off the Centro building in Rockingham (in the Perth Metropolitan area ) and then the lift and precision placement of the eight new air conditioning units back on to the building. The operation on site was less than 1 hour for this to occur saving the customer the hassle of getting in a 500 ton crane with a 190 foot jib so the A/C units could be positioned into the centre of the building saving tens of thousands of dollars. In 2009 Helispecs was contracted by the Department of Environment and Conservation to lift all materials on and off Breaksea Island for the Heritage Restoration of the lighthouse cottages.All building materials from timber, cement, windows,roofing iron ,sand tanks,tools and consumables where sling loaded to the island. Helispecs completed 180 hours on this project as a helicopter was the most efficient and cost effective way of completing the operation. 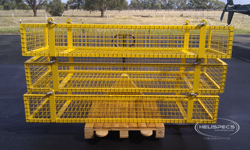 Helispecs has a full compliment of approved lifting equipment rated in excess of a weight load limit of 2 tons. With long lines, short lines, light weight baskets, lifting frames, nets and lifting straps/slings Helispecs are set up for any lifting operation. 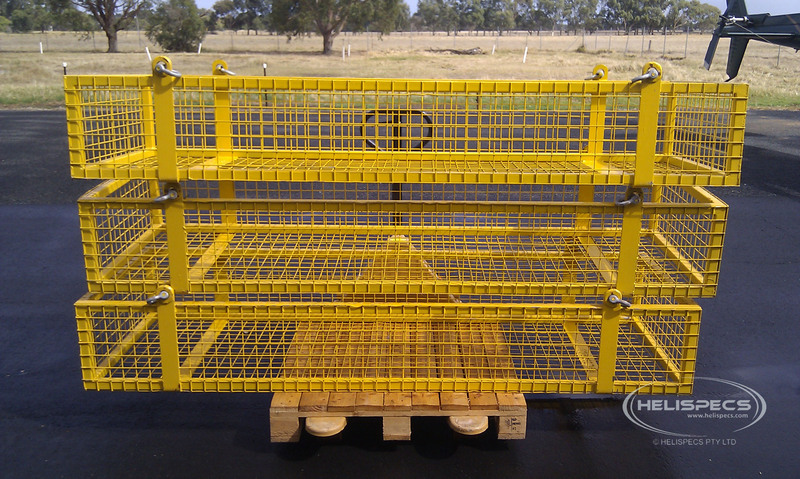 For the lifting of loose, tools or materials that are small and awkward to strap together, These baskets have been used or requested on jobs such as the walkway at Castle Rock to speed up the transport of building materials and tool on to and off site.